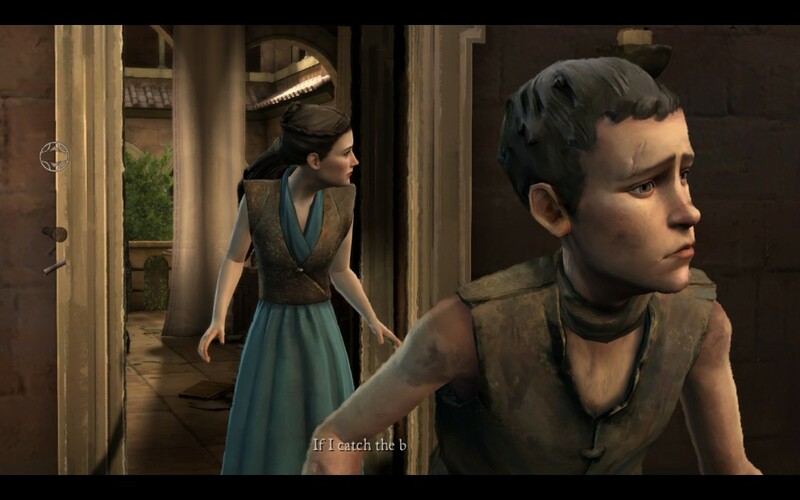 Telltale’s Game of Thrones “The Sword in the Darkness” has me more conflicted than I initially thought I would be. On one hand it does exactly what I’ve wanted the series to do since episode 1. There were multiple moments throughout this episode of Game of Thrones that the Forresters seemed to finally find their footing and take center stage. Unfortunately the episode didn’t seem to grip me like the others before. That’s not to say there weren’t plenty of decisions that can define the episode and series as a while. In fact, the episode presents on of the most significant choices early on. Asher, the exiled son of Lord Forrester, finds himself needing to make a quick decision. Not knowing the outcome and the immediate danger at hand, Telltale ramps it up a bit by making you choose as quickly as it might’ve seemed for Asher himself. I found myself immediately regretting the choice and had to suffer through the consequences for the rest of the episode, something that I’ve felt many times before with Telltale’s Game of Thrones. 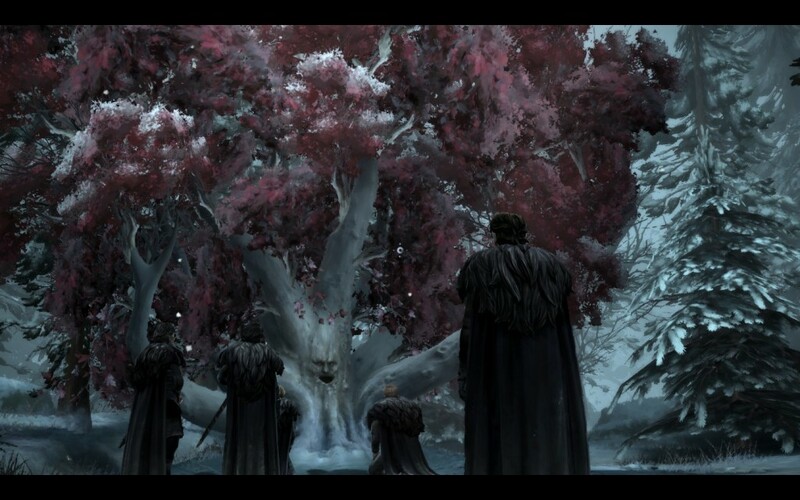 The weirwood stands tall as Gared prepares to take the Black. While this choice is hard, the hardest in my opinion comes as Rodrick, the current Lord of Ironrath. Since I’ve been playing on the same save file since the first review went live, I’ve lived with every decision, even the ones I regretted like that above. However the perceived repercussions with choosing one path over another made me seriously doubt which way to go. Thankfully there was no time limit set on this one as I actually needed to get up and clear my head before making my choice. “The Sword in the Darkness” does a good job mixing the action sequences with the narrative and each character you control really seems to come into their own in this episode of Game of Thrones. The Forresters of Ironrath seem intent on standing tall, and Telltale is finally letting them do so. Even Talia, the twin sister of Lord Ethan, is a symbol of strength in the household. The pacing in this episode is perfect, with the scenes not going back and forth in the same way we’ve become accustomed to in the TV show allowing ample exposure to each segment of the story. And the narrative is extremely well-written which really draws you into the game and the vent surrounding the fallen house of the North. The dragon fire leaves something to be desired. Unfortunately, this is the first episode in the series where I felt the visuals brought me out of the experience. 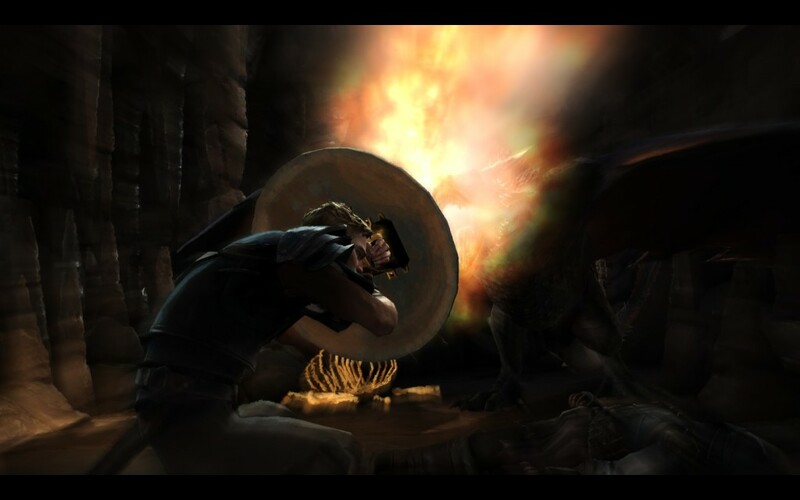 Telltale’s aging game engine is pushed to its limits in this episode and while normally I don’t place a lot of stock on having photo-realistic visuals in the game if the art direction is on point, the engine running Game of Thrones doesn’t help itself in this episode very well. Early on you happen upon Drogon and while the initial shock of having to square off with a dragon hits you quickly, it wears off just as quickly as well. When his flame breath crawls across the screen I was instantly brought out of the moment, instead finding myself reminiscing that the flame effect reminded me of my time with the spray paint feature in MS Paint. Artistically I really enjoy the overall watercolor, painterly presentation, but in a moment that is supposed to create awe and fear, I was left with wondering if I could draw up my old tagging artwork from middle school. To that end, the visuals of Game of Thrones really did a disservice to the rest of the game. Also disturbing were some stuttering in places, especially towards the end of the episode. I would make a decision in the narrative and the scripted response would start to play only to have everything reset — audio, animation and all — a second or two into the action. If it only happened once I wouldn’t bring it up. Nothing is perfect, after all. However one scene had every action cause this issue and it was incredibly disorienting and off-putting. Some moments that likely should have had more of an impact really had none at all, because I was focusing more on the issue and the narrative itself. Mira and Coal Boy are up to no good yet again in the Red Keep. When the scenes worked, some of the best actually take place away from Ironrath. Telltale’s Game of Thrones is set during the events of season four, so even though some events we know will happen are shown in the game, the way the writers were able to weave them into the storyline of “The Sword in the Darkness” made them feel fresh and new. The Purple Wedding, one of the most iconic scenes in the book and season 4 felt fresh and new because of your involvement with Mira at King’s Landing. The focus wasn’t on the event, but rather the story of House Forrester, and that worked in making me feel a bit bewildered when Cersei started shrieking. Seeing Tyrion Lannister led by you in irons really struck a chord and made me feel for Mira, the handmaiden who had put all her hopes in the alliance she had forged with the Imp. Even Gared’s scenes picked up some much-needed steam, and the touch of the “sing-a-long” Night’s Watch Vow was nice indeed. I felt a bit ashamed when I didn’t select the next line so Cotter and Finn finished their vows before I did. While the climactic event was a bit predictable, I didn’t see it happening in this episode but rather the next. 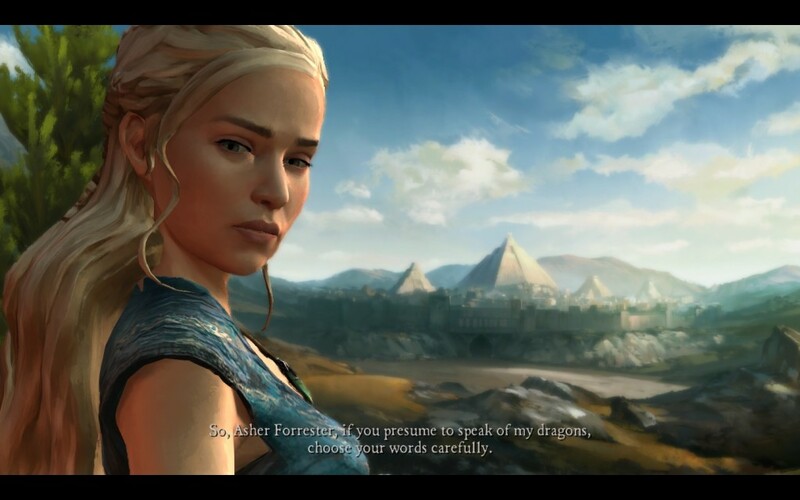 Daenerys makes a cameo, finally, in the Game of Thrones series by Telltale. Voiced by Emilia Clarke. In the end, Telltale’s third episode for its Game of Thrones saga had a bumpy journey for me, but the content really makes it worth playing again and again. Though the visual style started to show it’s edges and age, the story it portrays still drives the game forward, so while the spray-paint fire was awe-nullifying at first, the confrontation in the next segment made me forget about that during the playthrough. Unfortunately the hitches with the game stuttering for a full scene (I even went back and re-played it three more times to see if it was a one time occurrence. It wasn’t) brought that back to the surface. Hopefully Telltale can capitalize on what it is doing best: making each character feel unique and wholly a part of Martin’s world, especially as momentum gains towards the back-end of the series. Game of Thrones Episode 3 sets the stage for the latter half of the series. Though the story, sound direction and gameplay are pretty much on point, aging visuals and major stutter issues do mar the overall performance in game. Freelance Game Journalist, currently covering games for Legendarium. Tolkienist. Once thought he saw a woodchuck chuck wood. Turns out they can't.